Sides in the political debate seem to be talking past each other. "In the current budget year, federal tax receipts will equal 14.8% of the gross domestic product, or GDP, lowest level since Harry Truman was president. 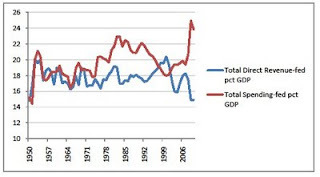 In Bush's last year in office, tax receipts equalled 17.5% of GDP, just below their 40-year average." - USA Today 2/8/2010 with many many echos. "Right now we are spending at an all-time high, close to 25 percent of our GDP [is] being spent on the federal government. But our revenues are at an almost all-time low of about 15 percent [of GDP]." - Mark Warner on Sunday, April 17th, 2011 in a TV appearance. with many many echos. However, the revenue will begin to self-correct as economic growth increases. The spending is projected to continue at very high levels and is driven by the growth of transfer payments, especially medicare. Failure to act to reduce spending will result in a continuing gap between revenue and expenses that would have to be filled by further borrowing. Not all of the revenue gap between 15% and the more historically normal 18% is going to come from economic recovery. Some revenue tweaking will get there both faster and more reliably. The worry is that such measures are then left in place and cause overshoot above an 18% of GDP target and such 'exess' revenues are then spent without remorse or pain by progressive politicians on wealth redistribution. Accurate Reality: There is a case to be made to tinker with taxes to get revenue back up, but its implementation is fraught with peril. 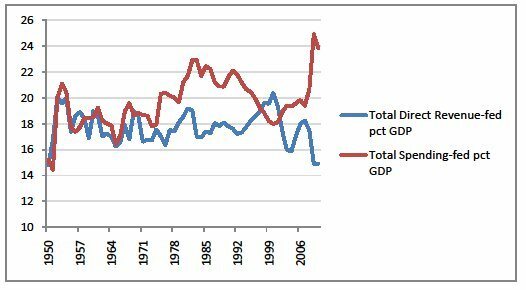 There is a very strong case to cut spending by 5% of GDP or about $700 billion per year. This is about 20% of all Federal spending. Godspeed.